I love to follow the trends in popular nutrition. Lately I’ve been reading a lot about the Bulletproof Executive Diet, and in particular the new drink that’s becoming popular among my office mates, coffee with melted butter in it. Among the things that the people who follow the Bulletproof Executive say about their drink is that it makes them feel alert, smart, and very satisfied. It all sounds very promising for drinking something as simple as coffee with butter in it. But some of us don’t like coffee. What’s that you say? Not like coffee? It’s almost as if I committed the sin just by typing the words. But yes, it’s true, there are some of us who do not like the taste of coffee. I never learned to enjoy the taste of coffee when I was growing up. Or at least, I never got past the taste and became addicted to the other effects. To me coffee always has a bitter, acrid flavor that reminds me of hot water being poured through burnt beans. Ewww! So I never came to rely on coffee to wake me up in the morning. As a result, I’ve spent most of my life avoiding caffeine products in general. Not being a regular coffee drinker, caffeine’s effect on me is very strong. As an outsider, I can see how coffee has become a cultural and social phenomenon. Sometimes it’s confusing when you ask a friend if she wants to go out to “coffee” with you, and then actually don’t order coffee. Or you go for a visit with your favorite aunt and decline the offer of coffee, but try not to seem impolite. There are even artisan coffee houses showing up now that only serve their custom drip coffee creations, and going to one of them without ordering a coffee is almost an insult the owner. Happily for the rest of us, there’s a wide range of hot beverages to tempt us in the morning that are delightful and delicious, and don’t pack the bitter flavor and heavy kick of caffeine that coffee does. I’m talking about tea. I’m not a big tea drinker, but sometimes I truly appreciate a nice herbal tea when I feel like something warm and soothing. I just don’t turn to it for an energy boost the way other folks use coffee. But I do like the idea of a drink in that combines a satisfying flavor, a smooth texture, a healthy amount of supportive nutrients, and the satisfying qualities of healthy fat. That’s how I came up with my Invincible Coconut Chai Tea. The taste of a sweet spicy chai tea in the morning is one of my favorite things. It’s not something I indulge in every day, since the caffeine even in a cup of tea seems powerful to me. But it’s a treat that I find very invigorating and refreshing. Sometimes I like it cool with ice cubes, and sometimes I like it hot. And I always use heavy cream and maybe a drop or two of artificial sweetener, just to give it a lift. Taking the butter coffee concept, I thought about what goes well with chai tea. 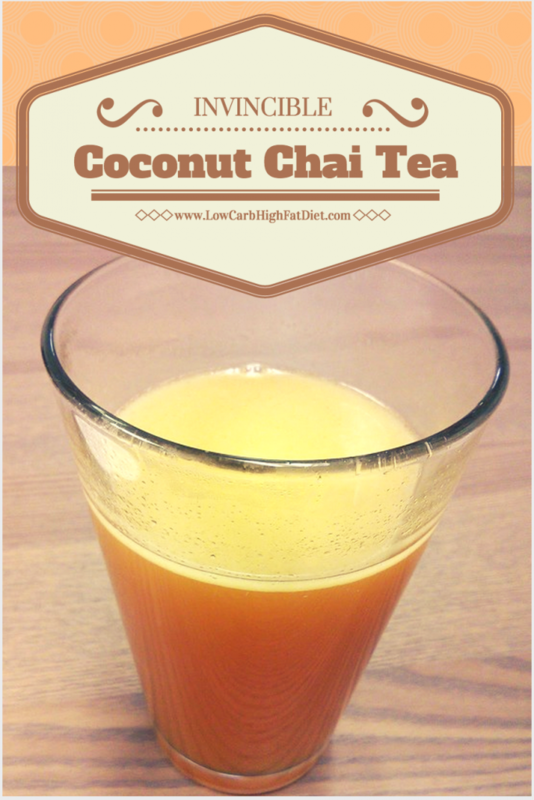 Well, I associate chai tea with Thai food, and one of the prevalent flavors in that cuisine is coconut. Coconut oil, as we know, has amazing health benefits. It also has a lovely, silky mouth taste, and melts at relatively low temperatures. So I decided to put some coconut oil in my chai tea instead of the cream I usually use, and see what it tasted like. In addition to the sweet and slightly thicker texture of the coconut oil, the flavor of coconut enhances the tea perfectly, and the feeling of liquified coconut oil against your lips give you the impression that you’re drinking a very satisfying, rich, creamy dessert. On top of that, you know you’re getting the benefit of coconut oil every time you take a sip. It leaves me feeling indulged for hours. What could be better than that? Of course, the oil does separate and float to the surface. The cream I used to put in my chai tea has the advantage of emulsifying easily with a water-based beverage. I learned something about the chemistry of how this works when I was high school; basically the molecules in milk have water receptors on one end, and fat receptors on the other. That helps milk products blend easily into water-based beverages like coffee and make them creamy, without separating. Getting the same effect with something other than cream is not easy. I’ve tried emulsifiers like guar gum. As little as 1/4 teaspoon in a cup of tea will help keep the coconut oil slightly better blended. But the overall effect is a little too thick and slippery for my taste. I prefer to keep a teaspoon on-hand and give my tea a little stir before each drink, to mix in the fat. Being a natural experimenter, I’ve also tried a few other combinations. One of my other favorites is Constant Comment orange spice tea with butter. I’d love to hear of what other readers are trying, and get some new ideas. I think this fat-enhanced tea concept could go far!